This used to be a tender port. From 2018 you will be berthing at a brand new cruise pier, which has been developed to handle the biggest vessels and can host two mega ships at once. The first thing that catches the eye when arriving at Port of Visby, is the impressive cathedral and all the rooftops of the stone buildings in the town, surrounded by the mighty medieval town wall with its towers. Centrally placed, Visby was for a long time the natural meeting point for sailors and merchants from all over the Baltic region. Still today, you can enjoy the majestic merchants houses from 17th and 18th century along with almost 200 stone buildings – some of them dating back from the 12th century. Still, the town is not a museum. More than 2,000 people inhabit the old town that offers a great variety of shops, cafés and restaurants. Here you can enjoy a promenade among picturesque ruins and charming rose gardens in some of the most idyllic streets imaginable. The town has been on UNESCO's World Heritage List since 1995. The 3.4 km long, well preserved stonewall is surrounding the old town with almost 200 stone buildings that have survived since the 12th and 13th centuries. 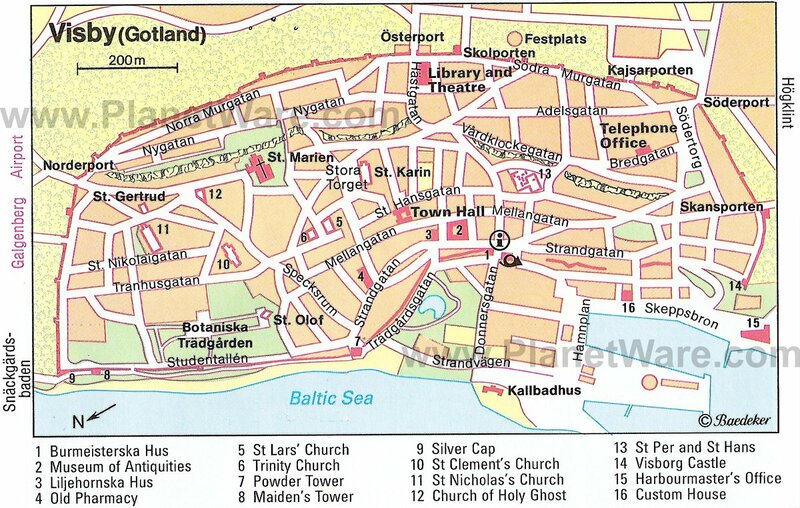 There are also many church ruins in the town, as well as majestic merchants' houses from the 17th and 18th century. Still, the town is not a museum, because 2,000 people live inside the Town Wall, and there are also many shops, restaurants and offices. The famous Botanical Gardens of Visby, dating from 1855, are just a 5 minutes walk from the Pier area. Gives you an overview of Gotland's 8,000-year history. The town is very walkable. Be aware that it is somewhat hilly and might be difficult for people with a handicap. As streets (alleys) are very narrow an organized tour is not recommended, as most will not be able to hear the guide. The rest of Gotland has also a great deal to offer. It is famous for its mild climate and the exotic landscape and has because become one of Sweden's most popular summer holiday destinations. There is an internet terminal in the tourist office. Most shops, at least downtown, are open all week, even on Sundays.